On a weekend near the 4th of July we, my parents, two younger sisters and I would pile into the family's 1948 Chevy and drive out in the county to a farm near Shultz, where my mother's classmate, Feeny, lived. The road into his house went up a creekbed bordered by a hill on the right and a grown-up pasture on the left, where a few cows grazed around blackberry bushes. 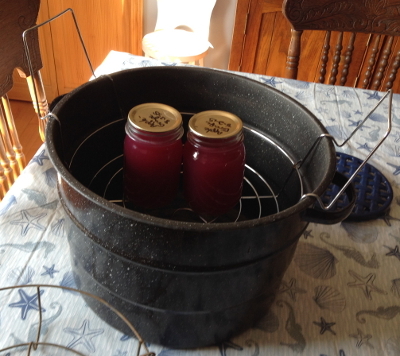 We pulled out of the trunk a washtub, five-gallon pail, and several picking buckets made by cutting the tops from grapefruit juice cans and punching two opposing holes to attach a wire bale. We'd get there early, before the heat of the day. With the picking-can bale fastened to my belt I would wander around avoiding others picking blackberries until my can was in danger of spilling. Then I would take it to where Dad had left the pail and empty it. When it was full, Dad would empty the pail into the washtub. 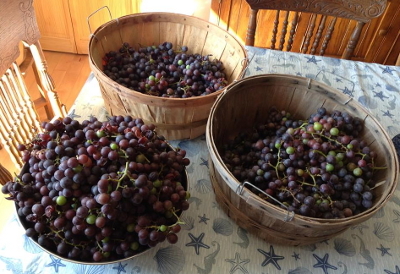 Before noon we'd leave with a trunkful of washtub, pail and picking buckets all filled to the brim with berries. That afternoon I'd help Mother sort out clean berries from a water-filled tub, pulling any stems, removing floating leaves and debris. When a container was full of clean berries Mother would fill quart jars, seal them with zinc lids and a rubber gasket, add sweetened liquid, and place seven at a time into a water-bath canner. 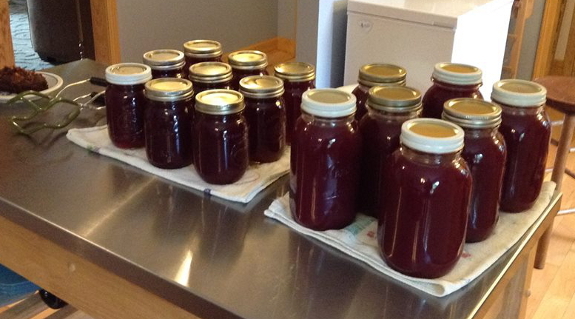 When they were finished she removed the jars, tightening the lids firmly and setting them aside to cool while she prepared another container full. Meanwhile I was sorting clean berries. We had enough from that day's work to eat a berry pie every Sunday till the next summer. 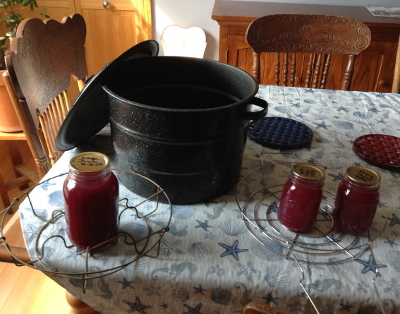 I still use a water-bath canner to preserve fruit, including grape juice and tomatoes. The tomatoes are cleaned, skinned after a parboil, and packed in their own juice made by shaking each full jar till it has liquid to an inch from the top. Tomato juice is easier to prepare using a Champion juicer. But we learned the hard way that the juicer grinds up grape seeds, giving the juice a bitter taste. 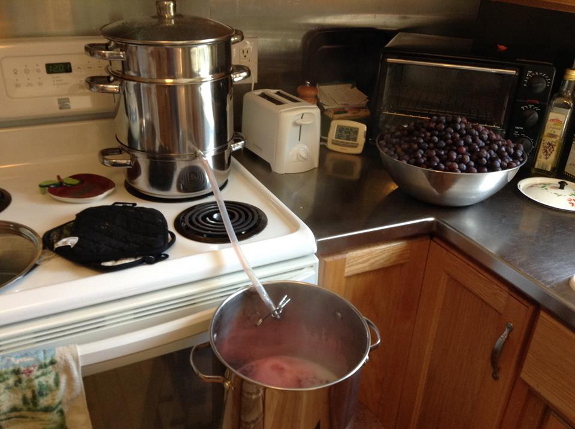 So we use a steam juicer (pictured above) for our grapes, pears, and apples. Of course, to can non-acid foods one needs a pressure canner. Although I grew up eating corn and beans canned in a water-bath canner, the experts no longer advise it. Today, I think, most just freeze these vegetables. Errol Hess is the author of Hunting Pennies, a memoir in verse about his Appalachian childhood. Enjoyed reading this. Because of the times new Roman, I thought Anna was writing. Then I got so far and was like, WHO IS WRITING THIS?? I think "mother" gave it away haha. I scrolled up and saw that it was indeed Anna's dad. Errol, I have an elderly neighbor who cans corn, beans, and squash in a water bath canner, and has done so for 60 years with no ill effect. However, she had the advantage of learning from her mother and grandmother who had done it their entire lives. She also cooks everything very thoroughly before it is consumed. When I told her she could die doing it that way, she just laughed and said she was more afraid of the pressure canner haha. Although I do not recommend this method, there are still old timers here and there who use it. I think it's pretty wise to leave it to them.